What Training Sword do I Choose? There are so many training swords available that it can be hard to choose if you are just starting out or are looking for some trainers to mess around with friends in your backyard. Those of you already training, likely know which discipline you are picking a training sword for. We have several trainers or wasters for nearly every martial arts form. We have shinai for kendo, boken for eastern or Japanese martial arts, tai chi and kung-fu swords for the Chinese art forms. We also have a wide variety of wasters for the Western martial arts. Next to the style of sword, the most important thing is to select a one made from a proper material for what you are going to be using it for. Are Wooden Wasters a Waste? Wooden swords have been around as long as their have been swordsman. Starting from childhood in any art form the wooden sword was key to training. It gave the student a non-sharp training tool so they could safely learn how to maneuver the sword around their body, practice offensive and defensive stances and even learning how to strike safely without the danger of a live sword. They are strong and sturdy so you don't have to worry about them being to flexible and whippy, but unfortunately this is also their weakness. They work really well for any forms and technique training but can be �hit or miss� for striking. When you smash two wooden swords together the hardest and heaviest sword is likely going to win, leaving the other left in splinters. The wood doesn't flex, it absorbs the entire shock of the blow and if it is too much, it will break. We have stronger red and white oak pieces if you are practicing light strikes and also have some other varieties available. The economical pieces are made from�Random� woods. To keep cost low, they are made from a variety of softer woods depending on what type is least expensive at the time of production. These pieces are great for practicing technique but we advise that they are not used for any form of striking. What if I want to Strike? The nice thing about learning sword disciplines today is we have hundreds of years more production experience than they did in the medieval times. We also have many synthetic materials that may make the �old school� knight shake his head, but are far superior to the traditional wooden waster. The top grade polypropylene trainers are lighter and stronger than their wooden predecessors. Using the same concept as tempered sword, the poly sword will flex on impact quickly dispersing the shock. If you know that you will be striking with your training swords we highly recommend that you have a look at the synthetic pieces we offer. They are available in a variety of styles for the different martial arts forms and are suitable for forms, technique and full striking. So which practice sword is best? That is entirely up to you. 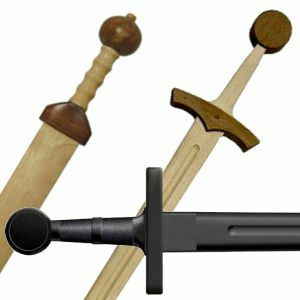 If you prefer traditional or more period correct training swords then the wooden swords are the way to go. If you are looking for lighter, faster pieces for hard striking then the polypropylene swords are a sure winner. Either one you choose, you will still be on your way to learning the sword and preparing yourself to safely wield some live steel. Always keep in mind if you intend to spar with training swords that you seek out proper training and acquire and wear proper safety equipment.